Boston University’s efforts to remove the Armory and add three large dormitories, a hockey arena and a student recreation center at the Student Village site will continue in late spring with some modifications to original plans, according to BU spokesman Kevin Carleton. The site is located between Commonwealth Avenue, the Massachusetts Turnpike, Buick Street and Harry Agganis Way. A report released by BU in early December estimates construction will begin in Summer 2002 and continue until Winter 2005. Community representatives and BU officials met Dec. 19 to discuss updated Student Village project plans released by BU in early December, Carleton said. The next step will be to get approval on the new version of the plans from the Boston Redevelopment Authority, which could take several months, according to Carleton. Carleton said the plans for the Student Village site will include four high-rise housing complexes on the back side of the lot nearest the Massachusetts Turnpike, a 6,000-seat athletic arena on the corner of Commonwealth Avenue and Harry Agganis Way, and a sports and recreation center to be built on the corner of Commonwealth Avenue and Buick Street. One of the four housing high-rises was opened in August 2000, located on the back corner of the lot, against the Mass. Turnpike and Buick Street. When the site construction is complete, Carleton said it will bring the total of BU’s student population living in on-campus housing up to 90 percent. Approximately 80 percent of students live on campus now, according to Carleton. “In order to bring more students on campus, we need to provide the kind of housing they want,” he said. The BU Task Force surveyed the student body extensively before new plans were drawn up to find out what facilities would bring juniors and seniors into on-campus housing, according to Carleton. Carleton said not only would bringing more students into on-campus housing be preferable for BU’s Allston and Brighton neighbors, but it is also better for BU students. 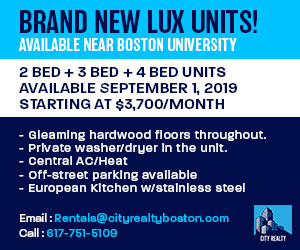 Carleton said the new developments will give students an easy alternative to the highly unpredictable and expensive Boston and Brookline apartment housing markets. Allston Civic Association leader Paul Berkeley agreed. Berkeley said student expansion into the neighborhood has hurt the diversity of a neighborhood that used to be mainly families with children. With fewer students in the neighborhood, the community could begin to return to its roots, he said. The updated plans are significantly different from the original Student Village plans, released in January 1990. The report indicates a 32 percent reduction in daily traffic to the site from the old plans because of reduced commercial space, fewer parking spaces and fewer arena seats. Original plans called for an 8,500-seat arena. The few units of staff housing in the original plans were also eliminated, as new plans include more student housing and sports recreation space. Carleton said the housing units were moved from the eastern edge of the lot, against Buick Street, to the back edge of the lot, against the Mass. Turnpike because the slope of the lot makes the high-rise buildings look smaller from Commonwealth Avenue when located at the back of the lot. Several community organizations have expressed disappointment in BU’s plan to remove the historic Armory building, built in the early 20th century for the Boston Cavalry. Though community members have objected to the destruction of the Armory, Carleton said the location and nature of the site makes keeping the Armory or its frontal facade impossible. “The impact on the possible housing space and the utility of the [Armory] building are such that it really works against re-use of the sight,” Carleton said. Though BU holds community task force meetings to go over future development plans, Berkeley said those meetings are not necessarily representative of the entire community. Berkeley also said the location of the meetings is not very conducive to community participation and they are usually poorly publicized to residents of Allston and Brighton. BU intends to present the plans to community members in Allston on Jan. 30 to answer several community groups’ disappointment in BU’s lack of consultation with community members, Berkeley said. Berkeley said many community members are worried about the extent of BU expansion plans. Over the past two decades, BU has bought many properties along Commonwealth Avenue and expanded into Brighton. Carleton said all current athletic uses of the Armory will be replaced by the new Field House athletic center, located on Ashford Street, which is scheduled to open this spring. Expanded on-campus housing would give BU greater flexibility to make necessary improvements and renovations to existing large dorms like Warren Towers and West Campus, Carleton said. Though no specific plans have been made, Carleton said BU would look at renovating possibilities. Admissions considerations were also a factor in making the Student Village plans, according to Carleton. Carleton said the more modern facilities could draw more prospective students to BU, though the total number of BU students will not be increased. “I think the whole Student Village will certainly have a positive affect on admissions,” he said.